Hi we are Mint and Lemongrass and as far as we know we re the most adorable feathered creatures Ever! We are a bonded pair and recently it was found out Mint has PBFD which means we need to go to a home with no other birds or a home that already has birds with PBFD. (more info soon!) 12/31/16 update - Lemongrass has tested negative so far but can still be a carrier. Right now Mint is starting to show signs with her feather condition of Psittacine Beak and Feather diseae. There is no cure at this time but advances are being made in managing the disease. The foster mom says these 2 are the perfect houseguest and Lemongrass is more outgoing than the shy sweet Mint but she might come around. This is a highly contagious disease for other parrots but is not spread to humans. 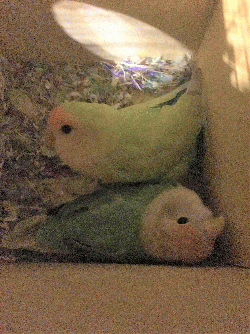 This wby they need a home with no parrots or parrots already PBFD positive. 5/2017 - Both birds have been tested by reputable avian veterinarians and do NOT have PBFD!!! They are healthy!